Our 24 hour pet hospital is located in Katy and serves communities west of Houston, including Barker, Bellaire, Bridgeland, Brookshire, Cinco Ranch, Cypress, Fulshear, Hempstead, Jersey Village, League City, Missouri City, Pearland, Rosenberg, the Spring Branch area, Stafford and Sugar Land. 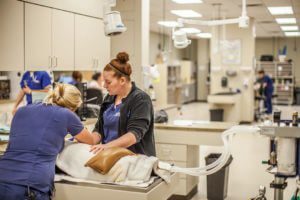 Alongside the Katy Freeway, our 6,000 square-foot BluePearl animal hospital in Katy offers 24 hour emergency care and is easily accessible from Interstate 10 and State Highway 99. Formerly known as North Houston Veterinary Specialists, Katy is equipped with a CT scanner, ultrasound and digital radiography. A board-certified anesthesiologist from our Spring hospital serves the Katy hospital. We are also home to a team of surgeons who are known as leaders in the practice of canine hip replacement.